They were in news recently after the Delhi High Court issued directions to the authorities to remove all encroachments around the Mathura Road Kos Minars and the monuments in its vicinity in Badarpur. Acting on the high court orders, the DDA and municipal corporation demolished about 30 shops and evicted the vendors. But the historical Kos Minars on the Delhi-Mathura highway and elsewhere have not been so lucky. Speeding along the national highway from Delhi to Agra, one sees Kos Minars flash past the roadsides, or notices them standing tall like a sentinel some distance away in the fields. Their recurring, rhythmic appearance makes one curious to know about these phallic shaped monoliths as when and for what purpose these were erected. 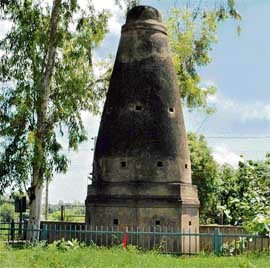 The geographic span to the Mughal empire had about 3000 kilometres of roads, accounting for nearly 1000 Kos Minars, erected by the Mughal monarchs (1556-1707). "KOS", a medieval measurement of distance, denoted approximately three kilometres, or two miles. Thus, the distance the two Kos Minars covered between them was approximately four miles. Akbar’s chronicler Abul Fazal recorded in his Akbarnama that Akbar issued an order in 1575 that at every kos on way from Agra to Ajmer, a Kos Minar should be erected so that those who had lost their way have a mark to find their path. Kos Minars, constructed for the comfort of travellers, eventually became an institution during the rule of the Mughals. After Akbar, his son and grandson, Jahangir and Shah Jahan, both added to the existing network of Kos Minars. In the North, they were extended from Agra to Lahore/Peshawar via Delhi, in the East to Bengal via Kannauj, and in the South from Agra to Mandu via Shivpuri. However, no systematic study has been undertaken so far to find out as to how many Kos Minars still survive. Perhaps the reason for this apathy is that Kos Minars were always seen singly as architecturally insignificant structures. But when one looks at them as part of a much larger design, their real significance emerges. For instance, some of major cities of historical significance, monuments and battlefields are situated on the route marked by Kos Minars. One discovers a network of caravan sarais (travellers’ resting places), and bawlis (stepped drinking water wells) — though some of them extinct now — built close to Kos Minars for the comfort and benefit of travellers. Nearly 400 years later, modern highways have come up much along the same route as one delineated by Kos Minars. Historical evidence has it that the Kos Minars played an important role in running the day-to-day administration of the Mughal empire. Each Kos Minar was equipped with a horse, a rider and a drummer to relay back and forth royal messages with speed. Historians maintain that their principal function was to facilitate transportation and communication. Enquiries made from the Archaeological Survey of India (ASI) reveal that so far no systematic study or census has been done to identify and count the surviving Kos Minars. Nor are all Kos Minars protected monuments, though some of them are. According to a report of the ASI, there are 49 Kos Minars in Haryana, of which 17 are situated in Faridabad district, seven in Sonepat, five in Panipat, 10 in Karnal, nine in Kurukshetra/Ambala, and one in Rohtak districts. And all of them, except the one at Rohtak, exist on the Delhi-Ambala and Delhi-Agra highways number one and two. Some of the Kos Minars have become victims of development, industrialisation and land encroachers. Others are on the verge of collapse and are crumbling and peeling off. Almost all of them, except a few like the one standing intact in its historical sheen at the Delhi Zoo and another one in Bhulwana village in Palwal on the Delhi-Agra road, lie in ruins. In Haryana too, they have forfeited their historical significance. Some of them have been encroached upon in violation of the Ancient Monuments Preservation Act, which envisages that there should be no construction within 200 metres of an historical monuments, or site. So far no efforts have been made for the maintenance and upkeep of Kos Minars. Perhaps the cognisance taken by the Delhi High Court might coerce the authorities to protect and maintain Kos Minars. Verily, Kos Minars present a great travel story, and need an immediate exercise to check their status, and retrieve them from oblivion.